See more objects with the tag repetition, monochrome, trompe l'oeil, buttons, puckered, tufting. See more objects with the color rosybrown darkslategrey or see all the colors for this object. This is a Sidewall. It was manufactured by United Wallpaper, Inc.. It is dated 1952 and we acquired it in 1991. Its medium is machine printed on paper. It is a part of the Wallcoverings department. Here is another way to get the look of fabric covered walls. This simple yet elegant design of button tufting printed in a saturated red would soften the look of any room. 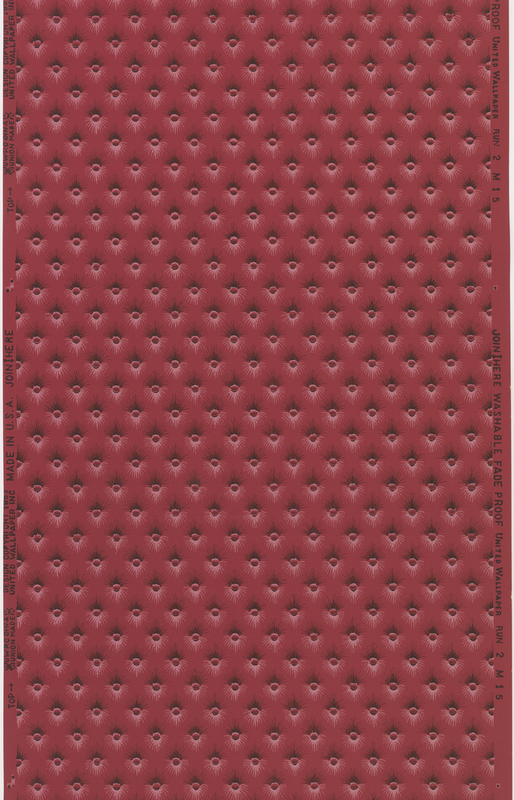 While the small scale of the design creates a nice background pattern the deep red color calls out for attention. Would be equally attractive covering all four walls, or hung in panels for a more pared down look. Printed on selvage: "JOIN HERE, WASHABLE, FADE PROOF, RUN 2 M15, DESIGN COPYRIGHT 1953, U.W.P.C. OF N.A. MADE IN U.S.A."